Part of the inter-institutional campus for health science education and research, the multiple award winning 268,000 square foot, six-story facility consists of administration and faculty offices, lecture halls, learning studios, flexible classrooms, student and faculty services, clinical skills suite, simulation suite, gross anatomy facilities. Completed 2012. 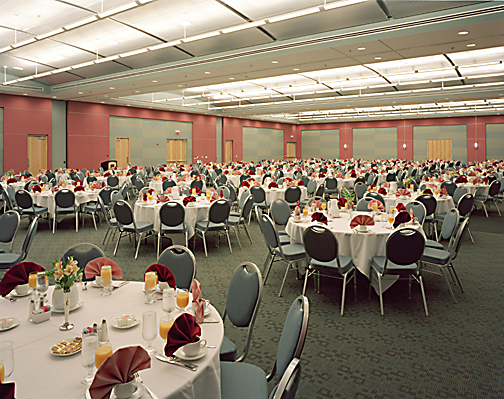 Full acoustical (includes Ballroom and Meeting Rooms). Full acoustical design for new 120,000 square foot laboratory building. 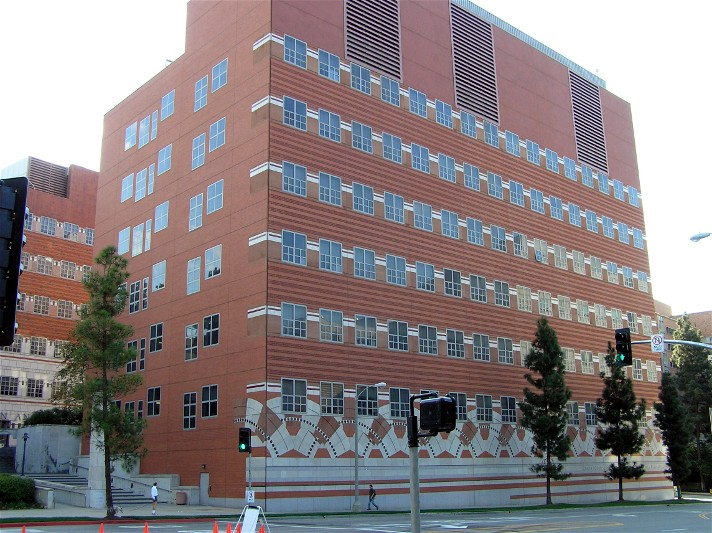 This 120,000 square foot, $85 million project houses Emerson College seniors, who live and study at the center while interning with companies in Los Angeles. The project achieved a LEED Gold rating and includes approximately 23,000 square feet of academic facilities and 57,000 square feet of student housing and staff/faculty apartments. The facility also includes a mix room and a 46 seat screening room, which were both designed to professional standards. Full acoustical design for new library. 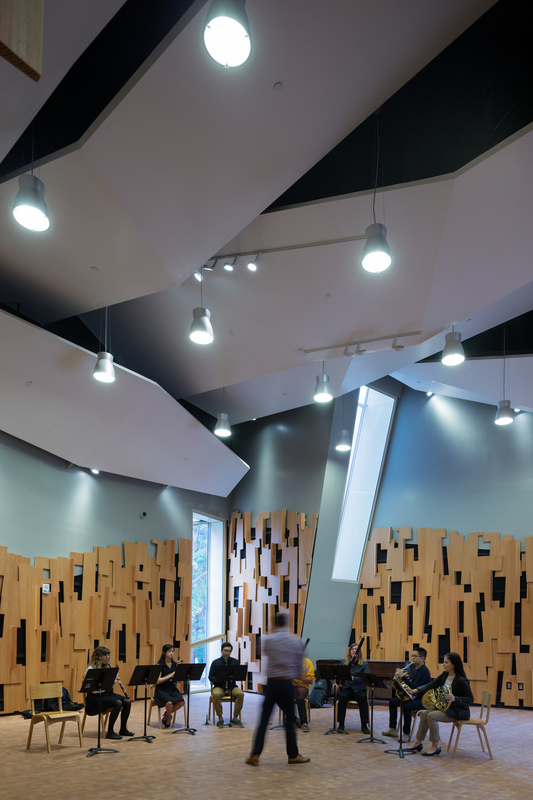 Full acoustical design for the School of Foreign Services and Student Center. This landmark ‘campus within a campus’ project designed and constructed in three phases between 2006 and 2013 comprises of approximately 230,000 square feet of new construction, with a $200 million+ construction budget. The facility includes 10 Screening Rooms, ADR and Foley Recording Rooms, a Music Recording Studio, Sound Mix Rooms, Labs, Classrooms and four sound stages. Full acoustical design for new 125,000 square foot laboratory building. Major renovation of 400 seat lecture hall and classroom building addition. Full acoustical design for large lecture hall and classroom building. Full acoustical design of 185,000 square foot research tower including biomedical research laboratories, administrative/faculty offices, conference center and 200-seat auditorium. Received two AIA awards from the San Fernando and Long Beach Chapters. 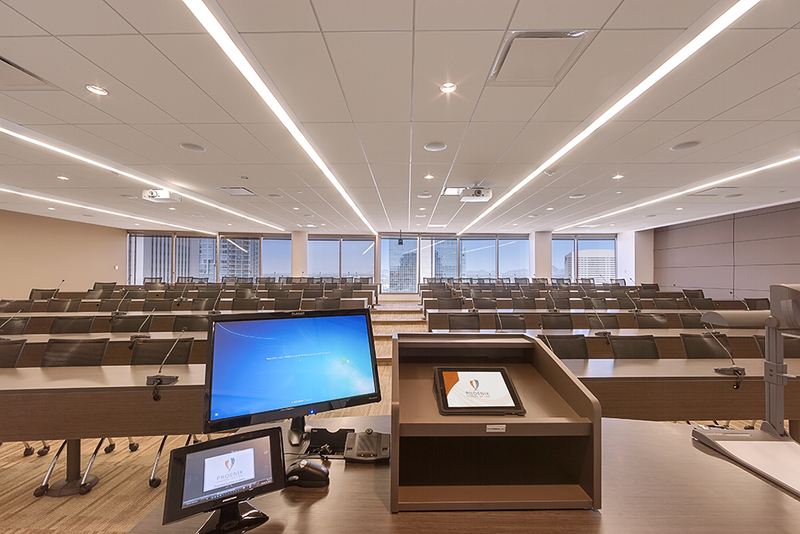 Located on the top seven floors of One North Central, a high rise building in downtown Phoenix, this 165,000 square foot, $11 million project includes eight general classroom spaces (designed as small lecture halls), student/faculty break rooms, and private offices/cubicle space. New 100,000 square foot, $50 million facility. Full acoustical design of new building, including sound stages, screening room and edit rooms. Full acoustical design for the relocation. Full acoustical design for new 130,000 square foot laboratory building. Following on from acoustical consulting for the 1999 renovation of music building including practice rooms and 525 seat auditorium which is used for concerts, recitals and lectures, we were selected as the acoustical consultant for a 23,000 square foot addition, completed 2015, which includes a state-of-the-art music recording studio, large ensemble/rehearsal room, faculty studios and Edit Rooms. Student Union Building including ballroom, meeting, recreation and study areas. Full acoustical design for a new law school, including teaching spaces. Opened 1997. Full acoustical design for the renovation. Full acoustical design for the 110,000 square foot, $26M budget instruction and research facility. Includes features such as classrooms, multi-media, assemblies and offices. Full acoustical design for the 93,000 square foot facility. Full acoustical design for new 134,000 square foot residence hall. School of Business and Architecture School Studio Building. Completed 2008. A 90,000 square foot, five story building with a partial basement containing a Learning Center, an Alumni Center, Computer Science spaces and meeting rooms. Full acoustical design for new 129,000 square foot laboratory building. Full acoustical design for a highly flexible space. Completed 2003. Renovation of 29,500 square foot, nearly 100-year-old building, including 200 seat lecture hall. Competed 2013. 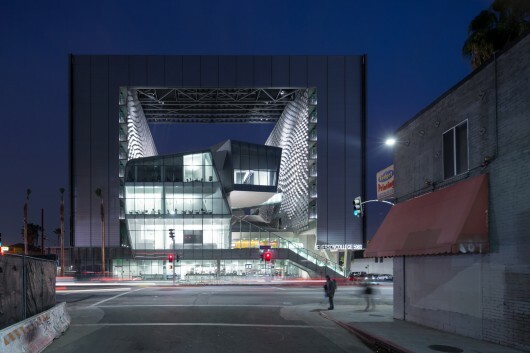 Awards included 2014 Interior Design Magazine: Best of the Year Awards (Education: University) and 2014 Los Angeles Business Council – 44th Annual Los Angeles Architectural Awards: Education Award. 184,000 square feet, $60 million, new engineering/laboratory academic building. Completed 2009. Certified LEED platinum. 95,000 square feet of renovation/new construction. Includes features such as multi-media capable seminar classrooms, laboratory facilities, library and faculty offices. Acoustical design recommendations for a 350,000 square foot ($113 million) building accommodating gymnasiums, swimming pools, fitness training center, multipurpose rooms, racquetball courts and classrooms. The building was described as “an extraordinary synthesis of place - cutting-edge architecture and dazzling interiors” by the Chicago Tribune upon completion in 2006. $60 million building for the USC Annenberg School for Communication and Journalism houses 23 classrooms, a 148-seat auditorium, a four-story atrium assembly forum, a 20,000 square foot media center with a newsroom, studios for digital, broadcast and radio and direct-to-Web vodcast production. The “Collegiate Gothic” exterior conceals a very modern interior that emphasizes visually transparent collaborative spaces. Completed 2014. Full acoustical design. 135,000SF, $34 million student union building incorporating 300-seat theatre and 10,000 square foot ballroom. Completed 2007. Nevada AIA Design Award 2007. This $172 million project includes 853 graduate micro-apartment units and 252 faculty and family apartment units. The project is targeted for LEED Gold.